How can I join this great work? Like the "Aaron and Hur" account in the Bible, our efforts are directed to help the leader/pastor of the local church in Indian lands. Ministry efforts are oriented to assist, encourage, train, mentor, and support the local indigent church, whether it be small or smaller...even if it be a single Indian Believer. God has brought about relationships and opened doors that we could have never dreamed. By our being "on the ground," we can provide connectivity between successive mission teams and Native American people and ensure an overall ministry effort that is consistent and continuing. ...To teach, mentor, and equip indigent leaders...who in turn will do likewise. 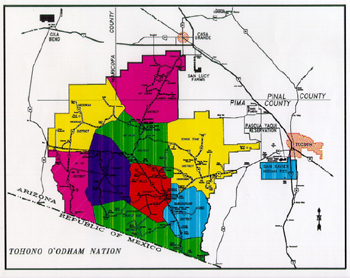 The Tohono O'odham Nation and their Pima cousins have resided on their ancestral lands since about 300 AD. Exposed to the white man's religion when the Jesuits came with Spanish explorers in the late 1600's, the naturally nonconfrontational natives openly received the version of Christianity brought by the Jesuit priest/missionary Father Eusebius Francisco Kino. Their story of Jesus synthesized easily with the O'odham pagan god I'itoi mythology which includes a great flood as well as a creator/creature hero who was murdered by public consent (like Jesus). Kino and three associates who joined him brought goods that changed the way the O'odham lived. Their introduction of wheat, cattle and other livestock provided food so that the people no longer had to constantly move about to search for the scarce supply of foodstock that grew naturally near the washes that carried water in the rainy season. The horses they brought made it easier to travel and to farm. "Western" clothing was gradually adopted. In short, the affect of Jesuit influence changed the O'odham culture and the missionaries could report that another group of natives were becoming "civilized." Still the people were not hearing an emphasis that they could have a personal relationship with the very Son of the One True God. They were introduced to "Anglo" religion but not necessarily to Jesus, their personal redeemer. Throughout the past century, more or less, evangelical missionaries have visited the Tohono O'odham villages with mixed results. Ktb Ministries has identified the presence today of mere handfulls of scattered believers. These true Christ followers are practically underground because of extreme pressures placed on them when they choose Jesus over "the old ways." While Tribal government allows for freedom of religion, being a Christian on the reservation means that you may well experience separation from your family and your village. Local evangelical "churches" often do not have the word church in their name so as not to appear adverse, but as an Outreach or Fellowship, etc. Yet, we have found them secure in the Gospel and solid in their faith. Typically their decision to follow Jesus in a personal relationship is not taken lightly...it may indeed have borne a high price. In an Indian Reservation (Tohono O'odham) larger than Connecticut, the number of "evangelical churches" can practically be counted on one hand. There are numerous "un-churched" believers because there are few leader/pastors. For many of the believers the cost and/or availability of transportation to another village for fellowship and worship is insurmountable. We see the need to begin local Bible study/worship cells in the remote villages. We, Ken and Thurleen Bain, are full time Mission Service Corps missionaries, primarily on the Tohono O'odham Reservation. Included in our work is a great amount of travel to encourage churches and cell groups around the country to link with the Indian fellowships. The "brotherhood" that we have experienced transcends both distance and cultural boundaries. When Christians connect in Christ with their Indian brethren, it forever changes both. It is an incredible experience to witness the beginning of a healing between those who, to some, were once considered the conquered and the conquerors. It is good for America. We can now see that the litany of our list of life experiences as well as our broad vocational base has all been to prepare us to work with these dear people who so desperately need someone to help them - to encourage them - to honor them. 31"When he finally arrives, blazing in beauty and all his angels with him, the Son of Man will take his place on his glorious throne. Recognizing that effective ministry to Native Americans is best done by Native Americans, our goal is to teach, mentor and train the Indian Believers who can in turn teach, mentor, and train other Indian Believers, who can then do likewise. Won't you be our partners? We cannot do this alone. We need the intercession of prayer warriors, and just like you, we need sufficient income every month to cover the costs of reaching Native Americans with the Gospel of Christ.